The most common situation today in Brazil, is to have families that view their children as workforce. If the child is poor, his/her destiny is to attend professional courses; on the other hand, rich children attend English, French, German, computer, tennis and soccer classes, all due to the fact that parents have already designed their future. Therefore practically everyone is constantly denied a future with self-determination, where individual choice is an option. 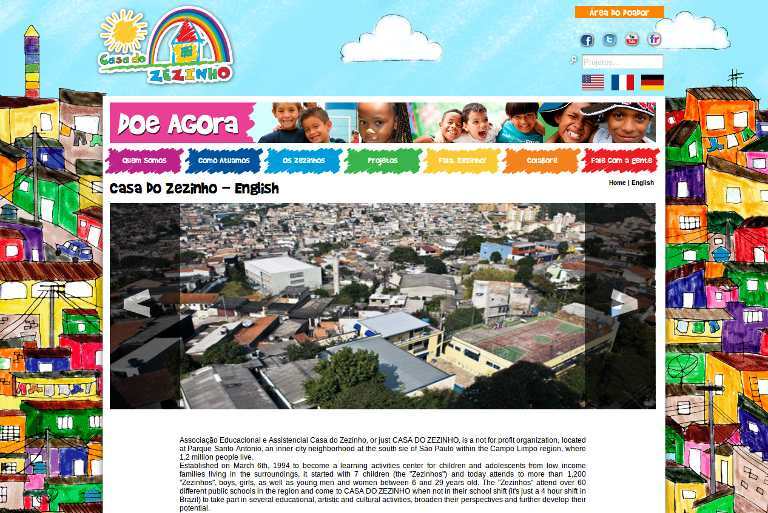 Associação Educacional e Assistencial Casa do Zezinho, or just CASA DO ZEZINHO, is Sao Paulo NGO established in1994 to become a learning activities center for children and adolescents from low income families. It started with 7 children (the “Zezinhos”) and today attends to more than 1.200 boys, girls, as well as young men and women between 6 and 29 years old. The “Zezinhos” attend over 60 different public schools in the region and come to CASA DO ZEZINHO when not in their school shift (it’s just a 4 hour shift in Brazil) to take part in several educational, artistic and cultural activities, broaden their perspectives and further develop their potential. Since its beginning, it has been a space of opportunities for children and youngsters submitted to high vulnerability conditions. They create conditions for children and young adults to develop critical thinking and self-reliance, as well the ability to make mature decisions about their own lives. It aims to be a place of recognition, respect, inclusion and friendship. This is Casa do Zezinho’s mission and making this happen every single day has been the drive behind all the action of its staff and volunteers. Located in what is called the “death triangle”, in the outskirts of the southern area of São Paulo the organization embraces children and young adults who live below the poverty line with no access to information, culture, and living in no more than 2 room-shacks, along with all their family members (usually 9 to 10), most of the time immersed in violence inside and outside their homes. To define their field of intervention and to develop a program for the children and young adults, they start with diagnosis and identification of the needs. They are fighting every day against problems such as low education levels; poor health, nourishment and living conditions; unstructured families; non-existent professional skills; lack of physical activities to stimulate the development of motor skills; lack of fun activities; and the absence of sound moral values, motivated by undue influence of the violent surroundings.